End your search for a new car and step up to a 2019 Nissan Pathfinder to enjoy a fuel-efficient vehicle that boasts a horsepower rating of 284 and seating for up to seven! With help from the versatile cargo and seating configurations, the 2019 Nissan Pathfinder has to offer, motorists can take on any adventure with ease. See this SUV for yourself today, drop by Premier Nissan of Metairie in Metairie, Louisiana or shop our selections online from your New Orleans home. The Nissan Advanced Drive-Assist® Display puts pertinent information right at your fingertips while Rear Door Alert system helps you and your passengers remain safe. The 2019 Pathfinder's Bluetooth® capabilities mean you can stay hands-free with your compatible smartphone and with help from the tri-zone entertainment system, all passengers can enjoy a long road trip. 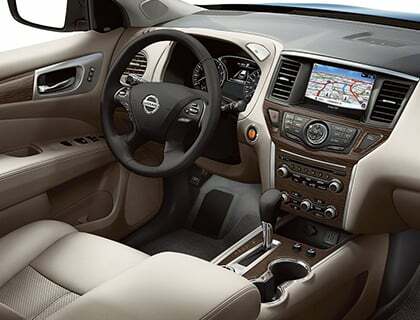 Upgrade your current vehicle to a new car that works to keep you comfortable while on the road, snag a 2019 Pathfinder from our new and used Nissan dealership near Kenner, Louisiana. The available heated second-row outboard seats help your passengers combat chilly mornings while the 120-volt outlet ensures all devices stay charged and ready for use. Contact our car dealership to learn about the available heated steering wheel and don't hesitate to value your trade-in before visiting us in Metairie, LA for a customized Pathfinder experience. Contact our new and used auto dealer to learn how you can add Nissan Intelligent Mobility™ to your new 2019 Pathfinder purchase. This suite of assistive features includes Automatic Emergency Braking, Intelligent Cruise Control, Rear Cross Traffic Alert, Blind Spot Warning and even an Intelligent Around View Monitor so that you can park with ease. See these systems in action by visiting our Nissan dealership in Metairie today. Our Nissan sales department is up-to-date on all the safety systems the 2019 Pathfinder SUV has to offer, so feel free to talk to us about the level of on-road protection you're looking for. We'll go over the anti-lock braking system, Traction Control System and Tire Pressure Monitoring System that boasts an Easy-Fill Tire Alert that makes adding air to your tires a breeze. The LATCH system helps you securely buckle in young passengers while the advanced air bag system is there to protect all occupants should an unavoidable accident occur. Our on-site Nissan finance department works with drivers of all credit scores, so if you're ready to explore the loan opportunities that are available to you, get in touch with us today. To ensure all 2019 Nissan Pathfinder shoppers are able to receive the financing assistance that they deserve, our dealership has made our credit application available online; complete one before getting in touch with our team!